Alice Ann Builta, 97, of Minonk, passed away at 8:37 p.m. Monday (Jan. 28, 2019) at Heritage Health, Minonk. She was born Oct. 6, 1921, in Bloomington, to Theodore and Mary A. Hughes Stimpert. She married Howard Builta on April 27, 1942, in Fort Sill, Okla. He died on Oct. 23, 2009, in Minonk. She was also preceded in death by her parents; one son, Howard C. Builta; and one daughter, Rev. Cynthia Taylor. Surviving are one son, Steven Builta (Maureen McGrath), Malta; daughter-in-law, Claudia Builta, Palatine; four grandchildren, Jeffrey (Claudia) Builta, Andrew (Erin) Builta, Kelly (Patrick) Sanders, Lyndsey (John) Eichlolz; and six great-grandchildren. 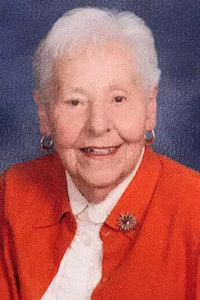 Alice was a member of St. Paul's United Church of Christ. She was loved by many and will be greatly missed by friends and family. Her funeral will be at 11 a.m. Saturday at Ruestman-Harris Funeral Home, Minonk. Visitation will be from 4 to 6 p.m. Friday at the funeral home. Burial will be in Minonk Township Cemetery. Memorials may be made to Shriners Hospitals for Children; Heritage Health, Minonk; or the Humane Society of Central Illinois. Tributes and condolences may be made at www.ruestmanharrisfuneralhome.com.